Learning how to save money can help you become financially secure and provide a safety net in case of an emergency. Money may not be the root of all evils, but it certainly is one of the major stressors haunting the Americans with 48% of them stating their expenses equal to or are more than what they make. This means nearly half of Americans are living paycheck to paycheck. Data also shows that 42% of them are also at the risk of retiring broke. The one major area that eats up a significant amount of potential savings is also the area where we can save the most in with a dash of ingenuity- Shopping. Shopping, as an activity, is woven so intimately into our culture that it has become the favorite pass time for many of us. It’s what we instinctively turn to when we are excited, stressed, sad, bored, lost, and even drunk. Making smart financial decisions and saving for our future is something we all aspire to do, but being continuously bombarded by persuasive advertisements encouraging the pesky “buy now” habit can make it difficult to put off getting things we don’t need. This article aims to show you how you can save money while still embracing your shopping habits. It’s an attempt to help you become a better and more mindful shopper. This way you can still have what you want without draining your bank account. Because it helps establish a strong keystone habit critical for wealth building: Saving. Keystone habits are those little habits that essentially spark a chain of positive outcomes in multiple areas of your life; saving is one of them. Think about it- shopping is an activity that most of us engage in, to some extent, every single day. Whether it is a quick stop at the supermarket to get milk, doing the weekly grocery shopping, going to the mall for clothes, browsing online for a new gaming console because you have an hour or two to kill, we part with at least a little bit of money every day. Going shopping with a mentality of saving primes your brain to avoid mindless spending. And if you can learn to save a little bit of money each day by becoming a smart shopper, this habit will also extend to other bigger purchase scenarios such as when you are out shopping for insurance, new car, house, or picking vacation packages. Regardless of where you stand in your income level, by shopping smarter, you can accrue a nice stack of savings that will ensure that you have a comfortable financial cushion to keep your future safe in times of economic uncertainty. Besides, little things add up. Making small savings every single day not only fosters your saving habit, but also the amount will add up to big savings over time. Saving just $200 per month (less than $7/day) can leave you with $2400 at the end of the year for your nest egg and emergency fund. Use cash back rewards apps- Ibotta is the most popular one, but there are many other available to choose from. These apps essentially allow you get cash back on stuff you are buying. Ibotta app, in particular, is not just limited to groceries; you can earn cash backs on restaurants, retail, pet stores and more. Getting cash back is easy. All you have to do is select the offer on whatever product you want, complete a very short task (like filling out a very short survey), go shop for the product, scan the item’s barcode, and snap a photo of your receipt as proof of purchase and that’s it! You can save on staple items like milk, toilet papers, detergent, snacks and plenty of other everyday things you would otherwise buy anyway. The cash back gets deposited to your account within 48 hours of purchase, which can be then cashed out via PayPal, Venmo, or as Giftcards for brands like Starbucks, Sephora, Best Buy, Amazon, Walmart and more. Refrain from impulse buying- The biggest money drainers are those little-something-extras that you don’t need but can’t help but reach for and put it in your cart because, well, what’s one item more anyway? One more item is one more thing that eats away your hard earned money that could instead be going towards tackling your debt or securing your future. In most cases, impulse shopping is an impediment that doesn’t just stop with one item. They come in groups and add up to your receipt. The quickest way to stop impulse buying is to be aware that you are prone to it. Try not to shop while you are stressed so that you avoid purchasing unnecessary items to feel good; clear your mind when you feel that urge of impulse building up your body by stepping away- maybe even changing aisles- to take a few breaths. After that, you can return to the same item and look at it with a lens of clarity and make a rational decision as to whether you need an extra tub of ice cream or not. Saying no to impulsive buying helps prevent compulsive spending. Doing this with every shopping trip, and not making unplanned purchases like a whim, can help save you a significant amount over time. Opt for store brands- Sometimes you visit the store with a well thought out shopping list that only contains items you really need. How do you then save? Well, an easy hack to do so is by choosing store brands over big name brands. A group of trained taste testers from Consumer Report found that generic brands mostly tasted the same and sometimes were even better than their costly competitors. They also found that store brands came with a 15-30% lower price tag, which can add up to a nice chunk of savings on every shopping trip you make. In many cases, the store brand and big brands use the same manufacturers to produce their products, so the similar taste makes sense. Rather than paying extra for the brand name, and pretty packaging, reach for its simpler generic alternative. Keep in mind to do this especially if you find that your options contain the same ingredients. Swap the plastic for hard cash- Credit cards can give you a false sense of unlimited purchasing power, unlike cash which is much harder to part ways with. When you cash to pay for any item, especially ones with a hefty price tag, it forces you to consciously think and be aware of how much money you will be spending if you go through with that transaction. Rather than fattening up your credit card with even more debt, try and adopt an all-cash diet instead. You might surprise yourself by actively searching for ways to stretch out the life of that $20 in your wallet. Carrying cash to pay your bills will wisen up your spending habits, and help you learn how to make the most out of what you have. Skip the middle shelf- Bargains get placed where you aren’t looking. The supermarket layout is inherently designed to make customers spend more. These corporations run on profits; their primary goal isn’t to help you save more. Variables like how the store is structured, the colors and words used, the positioning of every single product, etc. have a strong profit driving reasoning behind them. One of the old tricks supermarkets use to have adults spending more is by keeping the most expensive items at their eye level, which for an average shopper means the middle shelf. People buy what catches their eyes, especially if they are in a hurry and don’t have time to browse around. To score the lowest price options, scan the top and bottom shelf instead. That’s where you will find the most budget-friendly alternative for any product. Wear high heels- The recommendation to go shopping in heels to save money may seem odd. But, two marketing professors at Brigham Young University found that the sense of balance that you feel from wearing heels actually inspires to you to make balanced financial decisions. Marketers do a lot of things to prime the consumer’s state of mind to purchase their products, but consumers can equally do things to sharpen their cognition before making the purchase, rather than falling in the marketing trap and buying the high-end option right away. But wearing heels is not always practical for many of us. Thankfully, to achieve this sense of balance, you can do other things like going to the mall right after taking a yoga class, standing on one foot while shopping, tilting your chair back when shopping online, etc. Don’t buy in bulk- Shopping at bulk stores like Sam’s Club and Costco isn’t always a financially sound idea; it may result in overbuying. These stores have discounted goods which often cause people to spend more than they intend to or need to. 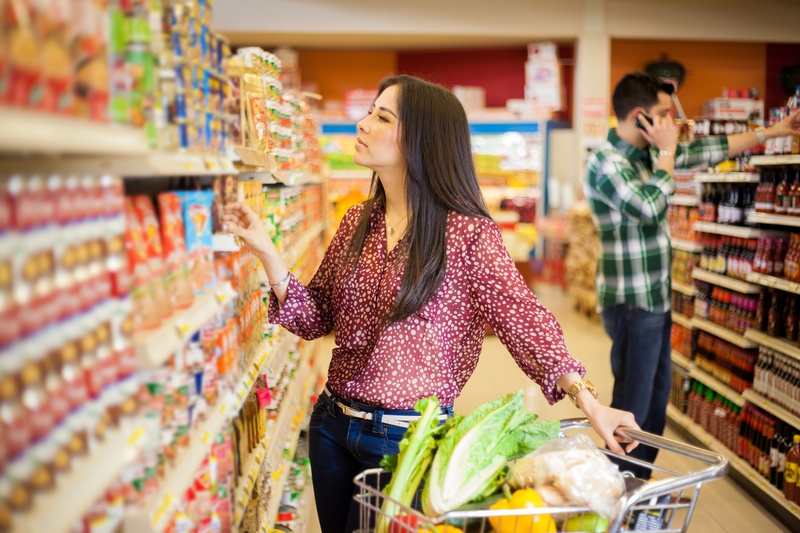 A study showed that people who frequently shopped at club stores spent 5% more on packaged food per person. Stocking up on canned, perishable food items in bulk can be quite wasteful because it’s very likely that you won’t finish them up before they go stale. The better alternative would be to make multiple shopping trips to your supermarket when needed to get fresh produce.. This way you only buy what you need. Reserve bulk stores for purchasing dry staple foods, like nuts and grains, and nonperishable items, like laundry detergent or toilet paper. Shop from clearance racks- Shopping in discount stores can help you save big on clothing and accessories. The prices at stores like TJ Maxx and Marshals are already lower than your traditional department stores, but they often have even additional sales where you can score major deals on your favorite brands. If you do shop at department stores, stick to clearance racks as much as you can. If there is a dress or sweater you want, but don’t need urgently, wait a bit and see if it hits the clearance rack. Also, keep in mind that you will often find out of season clothes at heavily discounted prices. This means buying a winter coat during summer, and swimsuits and shorts in chilly December. Go thrifting- If you can help it, things like books and DVDs should never be bought for full price because they are like cars. Their value usually depreciates the moment you leave the store. So buying second-hand books, vinyl records, and even home décor, clothes, and jewelry is a great way to save a lot of money. Thrift stores can be a hit and miss experience though, so to better your chances of actually scoring a good deal, plan your visits around a major holiday, like Christmas or Thanksgiving when people are more prone to donations. Also be on a lookout for sales. Most thrift stores have storewide sales, with some offering up to 50% off discounts towards the end of the year. Use websites like craigslist- Craigslist is not a site that many people think about when making big purchases, but unless you are strict about not buying used items, sites like these are great to find slightly used furniture, cameras, laptops, kitchen appliances, and even cars for a lower price. Another great benefit of Craigslist is that you can negotiate the price. Unlike stores like Walmart and Target, where you have to settle with the price relegated to the item, Craigslist gives the buyer and sellers opportunities to negotiate the price. The only downside to Craigslist is that like with thrift store shopping you have to be very patient to find a good deal because with over 60 million Americans visiting the site every day, there are lots of items for sale. Remember that saving money is both a skill and a habit that you must embrace to be financially secure. By practicing the art of saving on a common activity like shopping, we hone that skill and strengthen that habit. Besides, it's smart to start saving today when you have the luxury to do so because the economy is unpredictable. It’s never too late or early to safeguard your financial future. By saving just a few bucks using strategies mentioned above, you will be securing the future of yourself and your loved ones - who doesn’t want that? Interested in learning more about Seacoast Bank's personal savings account solutions?